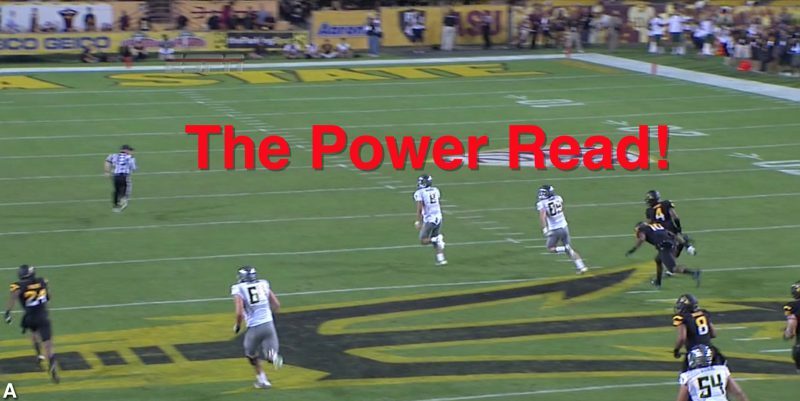 Oregon Surprises ASU with a New Power Read Play! I do not know where Chip Kelly comes up with all these new wrinkles, but as someone who studies his Offense, I find that it has become an analyst’s paradise with each weekly discovery. The Arizona State game was particularly subject rich, as we saw formations, motions and plays from nearly two years ago, last year…and NEVER BEFORE SEEN. We will have much to review in the off-season, but for now, we should look at another new play variation, the New Power Read Play! To best understand the progression of plays coming up, you will see us consistently start the play as above with the Running Back to the right side of the QB as they begin a typical Inside Zone Read play. We can note how Marcus Mariota (above) is looking at #21, the OLB for Arizona State, (Blue Circle) and “reading” him. Since he is staying, or “sitting,” MM then hands the ball off to Barner (Yellow arrow) who will run from right to left and look for a running lane on the left side of our offensive line. Pretty usual stuff for Oregon and this is our bread-and-butter play. The Power Play (above, against Washington) is meant to be a complement to the Inside Zone Read as the RB is on the right side and instead of running to the left side of our line, he runs straight ahead on our right side. The defense is looking to our left side, and when our left guard pulls, (Mana Greig #63) and leads the way on the right side of the offensive line, it is an easy touchdown! They think we’re going left and we go right and blast them with an extra blocker! I love it! Early in the game we line up (above) with the RB on the right, and the question is are we running an Inside Zone Read (Yellow dotted arrow) or the Power Play (Green arrow)? Barner is headed for the end zone (Above) as the extra blocker at the point of attack sprung him into the secondary. Note the OLB (Blue circle) is the player MM “read” and since he “sat” in the last picture, then the correct call is to hand off, as he did. Thus by “sitting” the OLB was too far out of the play and unable to catch our star Running Back. A good read, superb blocking, and stunning speed by Kenjon equals a huge touchdown! As an old offensive lineman—this screenshot gives me chills. A RB (above) breaking into the clear from tremendous blocking is always a beautiful sight. You see the guard who pulled, (Mana Greig #63) sealing a wonderful lane inside along with his teammates for Barner to take it to the house. Grieg has played extremely well in replacing Carson York (out for the year), and Nick Cody is also dinged up. Coach Greatwood has done an admirable job building depth on the offensive line that wins games! Arizona State was losing this game due to illness; they were sick of seeing this play as we score again on it (above)! We have the Inside Zone Read, the Outside Zone Read, the Sweep Read, and now this new play is the Power Read. Later in the game we see the Power Read beginning again, as Barner goes from right to left (Yellow dotted arrow, above) and our right guard pulls again to attack the left side of the line. Mariota is reading the Defensive End (Blue Circle, above) and the defender is clearly crashing inside. Note also how the OLB on the right (ASU #21) was blitzing to the inside and how the whole Sun Devil defense was moving to stop the play on the inside to prevent another RB touchdown. The ASU DE on their left has moved too far inside (Red arrow, above) so Marcus has pulled the ball as he can do with the “read” portion of the play. Arizona State so desperately wanted to stop this play that they blitzed and tackled our RB in the backfield (Orange Arrow)! We all know how this ends, as Marcus Mariota runs 86 yards for a touchdown (above), looking very Dennis Dixon-esce in the process. It’s interesting that DD ran for a long TD against Houston during his junior year, while MM is currently a redshirt freshman. See how the defensive backs have the angle to tackle Mariota? (Red arrows) We have not had a QB with the speed to outrun defenders like these since 2007! Actually this play is not new as we ran it against Cal last year and I was too puzzled to come up with a name for it then. However, Chip put the play back in his pocket and we have not seen it again until now! It is so dangerous for a defense as it blends all the components that we love in the Spread offense. It has power blocking from the pulling guard, a threat of a Bubble pass at the top of the screen that stretches the defense, and the “read” factor that can slice up a secondary with a mobile QB who can outrun defenders. This is a NASTY new play and I look forward to seeing how Defensive Coordinators in the conference move to stop it, along with our counters in return. Oh we love to learn about our beloved Ducks!